I love board/card games, so I decided to take a crack at designing one! The process of researching other board game mechanics, organizing different concepts, prototyping, iterating, usability testing, and designing all the visuals for the product itself, was what first motivated me to look into making the pivot from graphic design to UX design. An era of great unrest within the gravely compromised empire of feudal Japan. Your emperor is nothing but a figurehead while the shogun holds the true power. There are many men who desire to hold the title of shogun and then there is You. 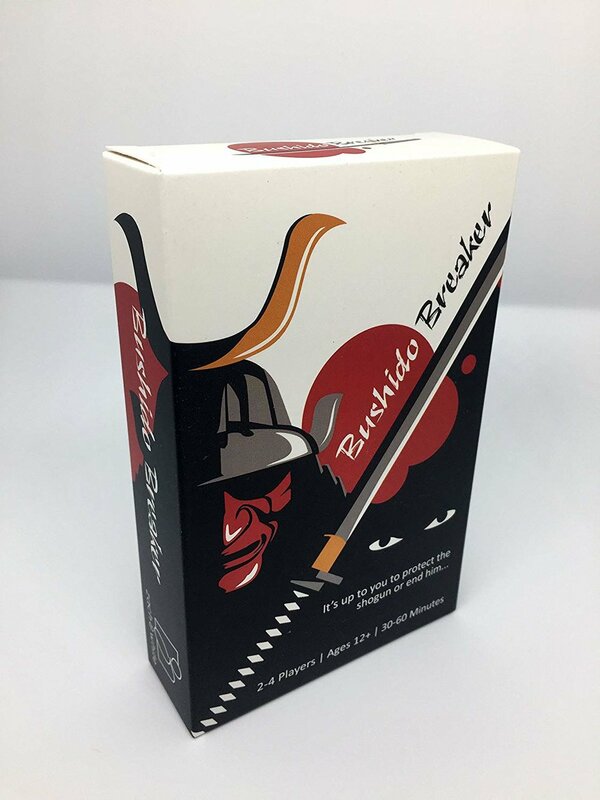 Bushido Breaker is a 2-4 player card game that takes around 30-60 minutes to play. It is a hidden movement game that involves deduction, strategy, reading people, and calculated risks. You choose to play as the ninja or as the samurai while your opponent plays as the rival faction. As the ninja, You are secretly moving from location to location, killing samurai and/or sabotaging the alarms along the way. Your main goal is to kill all the samurai or sabotage the required number of alarms, before going into the Shogun's Chamber and assassinating him. 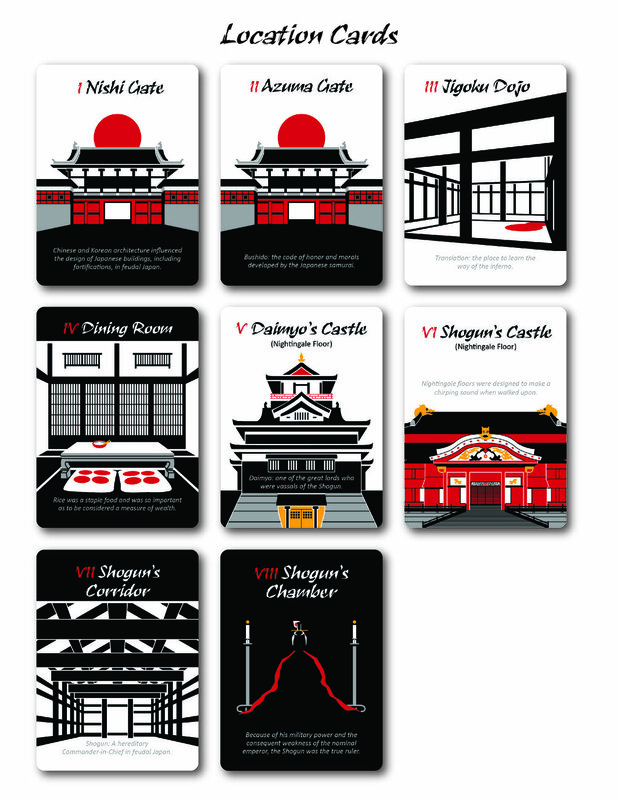 As the samurai, You control up to seven samurai; each in a different location. You are looking to catch the ninja by noticing him in the act of moving locations, sabotaging alarms, etc., or by countering a ninja's attack and killing him. Research started with looking into board game mechanics conventions, especially within the "hidden movement" realm. I then dove in - head first - to learning about designing, playtesting, crowdfunding, and finding reviewers for board games. I also researched Kickstarter, since board games are the most funded products on their website, and discovered some of the mistakes other companies had made in past Kickstarters (example: not factoring in their shipping cost of the products). The progression of the design from paper prototypes, to digital print-and-plays, to the production copy. Brainstorming and sketching ideas for components. Playtesting, looking for small design tweaks, and removing/adding some abilities that did not test well. I started regularly posting updates on the progress of the game, on Twitter. I also started contributing to the board game community through Twitter, Facebook groups, Boardgamegeek.com, and by backing/promoting other board games on Kickstarter. I also worked with board game websites to have the banner ads I designed and articles I wrote be placed on their websites. Getting reviews for Bushido Breaker had the greatest impact on cultivating an audience, promoting the game, and building a solid reputation. I had more than ten reviews and a couple of them are shown below. 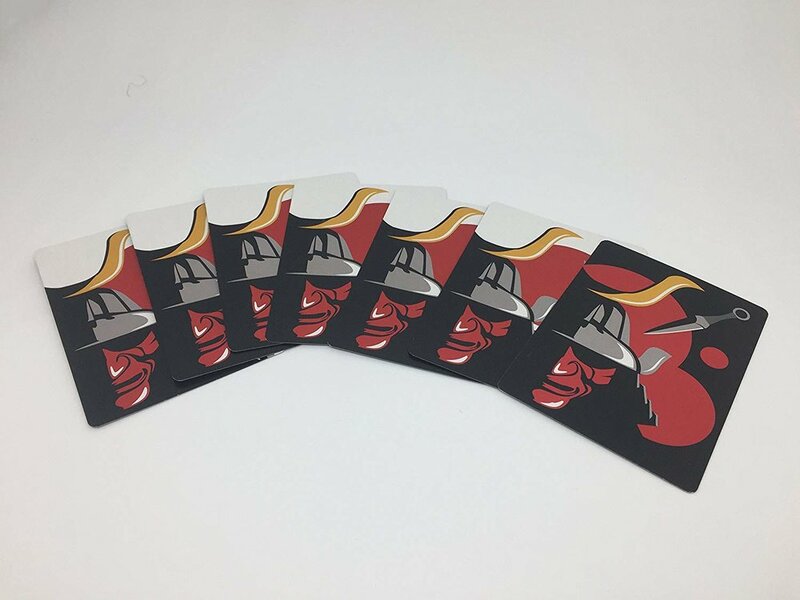 "An excellent deduction card game for two players, becoming very strategic when played as a team. 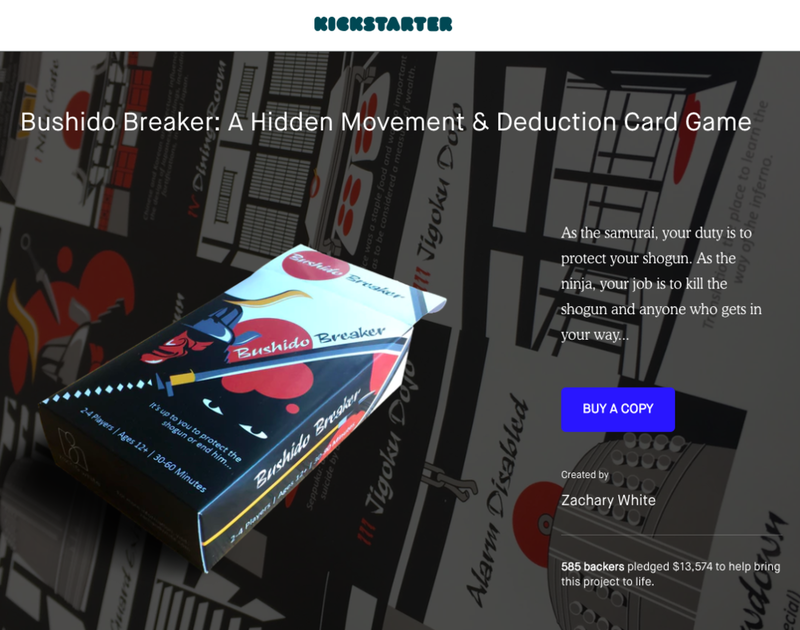 Bushido Breaker uses mechanics of a game very little exploited, the stealth displacement..."
Arguably the most crucial step; this involved a lot of research (thank you Jamey Stegmaier for your blog), and was a whole other project in and of itself. The project was successfully funded with 585 backers who pledged a total of $13,574. Now I have nearly 300 copies left that I sell on Amazon, my website, and through some local retailers here in Denver. Feel free to take a look at the Kickstarter page.